Promecotheca Dejean 1836: 387 Nomen nudum. Head: large; not prolonged between antennae; labrum transverse, subemarginate; mandible robust, truncate; maxillary palps thick, pubescent, palpomere 1 very short, 2 and 3 obconic, subequal in length, 4 longer than 3; eye large, convex, oblong-ovate. Antenna: filiform; at least ½ body length; antennomere 1 subglobose; 2 obconic, shorter and more slender; 3 longer than 1 and 2 combined; 4 to 7 obconic, decreasing in length; 8 to 10 cylindrical, each shorter than 7; 11 longer than 10, rounded at apex. Pronotum: cylindrical; convex; lateral margin obsolete; anterior margin slightly produced over head; with apical and basal constrictions plus strong tubercle between constrictions. Scutellum: oblong, rounded at apex. Elytron: lateral margin straight, smooth; exterior apical angle rounded; apex rounded, smooth; without tooth in sutural angle; with 8 regular rows of punctures, scutellar row absent; even interspaces subcostate. Venter: prosternum sinuate at base; mesosternum twice as wide. Leg: hind leg long, slender; femur without tooth. Australia, China, Fiji, Indonesia, Malaysia, New Guinea, Philippines, Samoa, Singapore, Solomon Islands, Sri Lanka, Tonga. Described species: 33 (Staines 2012). Key: Liu 1936; Gressitt 1950, 1957b, 1960a; Gressitt & Kimoto 1963a. Areca, Balaka, Calamus, Caryola, Cocos, Elaeis, Livistona, Metroxylon, Nipa, Oreodoxa, Phoenix, Phytelephas, Pritchardia, Ptychosperma, Ravenala (Arecaceae); Flagellaria (Flagellariaceae); Heliconia (Heliconiaceae); Freycinetia, Pandanus (Bryantia) (Pandanaceae); Saccharum, Miscanthus (Poaceae); Alpinia (Zingiberaceae). Blanchard, C. E. 1853. Voyage au pole sud et dans l'Océanie sur les corvettes l'Astrolabe et la Zélée: Exécuté par ordre du roi pendant les années 1837-1838-1839-1840 sous le commandement de M. Dumont d'Urville. Zoologie 4. Gide et J. Baudry, Paris. Gressitt, J. L. 1950. 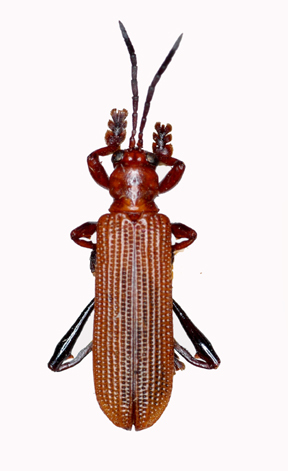 The hispine beetles of China (Coleoptera: Chrysomelidae). Lingnan Science Journal 23(1-2):53-142. Gressitt, J. L. & S. Kimoto. 1963a. The Chrysomelidae (Coleopt.) of China and Korea. Part 2. Pacific Insects Monograph 1B:301‑1026. Liu, G. 1936. Catalogue of the phytophagous beetles of China. Lingnan Science Journal 15(2):249-261.